2Lt Thomas W. Pittard (CP - Did not fly on two missions (357 & 358). Other six missions as crew CoPilot. Killed on 01 December 1948 by an intoxicated hit and run driver in Decatur, GA. Tom's second son was born six weeks after his death. 2Lt Art Freeman (B) - Was not a member of the original Lt Donalson crew. Did not fly on any Lt Donalson or 303rd BG(H) combat missions. Crew utilized their Togglier, Sgt Robert H. Lenhard, on all eight missions. Sgt Dale W. Naylon (WG) - Lt Donalson crew flew without a Waist Gunner on all of their eight missions. Sgt Naylon flew as a Togglier on one mission (364) with the 2Lt Robert W. Krohn crew. 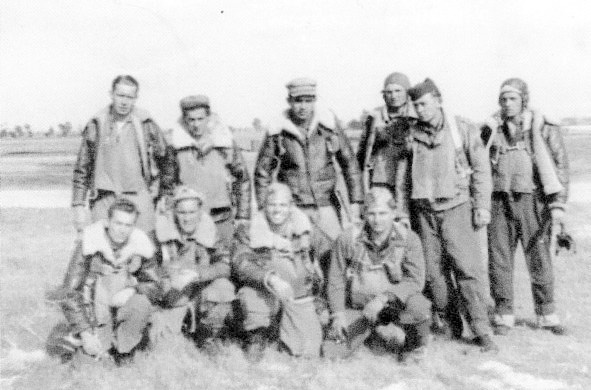 2Lt William F. Cahill (N), Sgt Robert H. Lenhard (Tog), S/Sgt Ernest E. Knight (E), S/Sgt Wilfred L. Kaliel (R), Sgt Ralph C. Brehl, Jr (BTG) & Sgt Robert E. Parr (TG) - Flew on all eight of the Lt Donalson crew missions. On June 19 1945 the 2Lt Donalson crew flew B-17G #43-39397 (Previous assignment unknown) from the 95th BG(H) airfield at Horham, England to Bradley Field, Windsor Locks, CT, thence to Camp Miles Standish, Boston MA.